LJ and I went for a ride today with her new bike trailer. I think she liked it. Mama sure did! I can't wait to go for family bike rides… finally! Quality time with this precious girl and her daddy is top on my list of priorities for 2011. I spent 2010 trying to be one of those "do-it-all mamas," and guess what I figured out? That's not me at all! I realized how much more balance I need in my life and I'm seeking it out now. I have no doubt that God has some great things in store, but I need to be more open to what He has planned instead of filling every moment of every day with busyness. That's how I've been feeling lately… and I just need some time to be… still. “Be still, and know that I am God…"
I'm also praying for the families of those who were murdered or injured in Tucson on Saturday. My heart is completely broken for them. Life is truly unpredictable and short- may we all make the most of our days. The hubby shared this video with me last night and I think it's just stunning… plus I have always loved this song. And! They used more than 700,000 Light Bright pegs to make it! Totally animation-free! Amazing. And what a sweet and sad and heartwrenching story to go along with it. It made me cry, but then again, I'm a sucker for these things- the song brought tears to my eyes long before I ever saw the video. Thank you for overcoming this heart of mine, o God. Shine by David Crowder Band. Yesterday at Starbucks I was chatting with one of the baristas who is pregnant with a little girl, due in January. That was me a year ago, and it feels like yesterday. She was oogling over LJ, and I looked at her and said, "Cherish every moment. It goes by way too fast. And you are going to LOVE having a little girl." Then the other barista said, "There is no faster hourglass than the life of a child." Sometimes, I look at my daughter, and I can't believe I'm a mother. I'm still in awe when I'm struck with the realization that God entrusted me with this little life, and how is she already eight months old, and she seems to hit a new milestone every day, and I can't believe how small she once was, and these tiny newborn clothes that I'm packing away are small enough to fit a doll, and she was soooo tiny and there's so much that I will never get to experience again with her. LJ has been commando crawling for a while now. And now she's getting up on her hands and knees and doing "the rock." She's learned to feed herself with a bottle, and yesterday I had to lower her crib mattress because she's starting to pull herself up. (Feeding herself a bottle? No, no, no! I want to hold her in my arms and feed her!) Obviously it brings me great joy when she reaches a new milestone, but it's always accompanied by this strange, bittersweet feeling that my tiny girl is growing so incredibly fast and I will never get this time back. And, looking back, there is so much I would have done differently if only I had known. reminding me that the journey is actually the best part. All I can do is be present every day. And count my blessings on each one of her ten tiny fingers and ten tiny toes. Moms… what do you miss the most about when your kids were babies? Visited Last Chance. What a madhouse. This article sums up the experience nicely. I got two rad pairs of shoes for a fraction of their original price- SCORE! Went to Macy's where I fell in love with and purchased a new backpack that we will be using as a diaper bag. It's perfect! Waterproof, lightweight, and SOLD OUT EVERYWHERE. Is it back to school season or something? I wasn't super nuts about the pattern initially, but it quickly grew on me. It's by Le Sport Sac, and in my humble opinion, with all the cloth diapers we have to carry around, it works so much better for us than the Petunia Pickle Bottom bag I was eyeing earlier this week… even though I love that pattern with an everlasting love. I enjoyed my new favorite treat, fresh mint frozen yogurt with thin mint cookies, at Mojo Yogurt at the Biltmore. I'm slightly obsessed with this combo and think I might die if they ever stop carrying that flavor. And now… all I want to do is eat pizza and drink red wine. 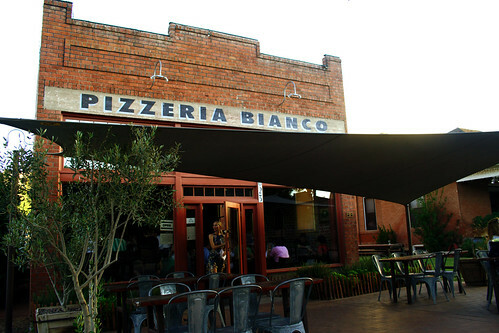 Therefore, to feed this craving, Cody and I will be visiting Pizzeria Bianco for the very first time like… right now. We will need a babysitter for this outing. Any takers? 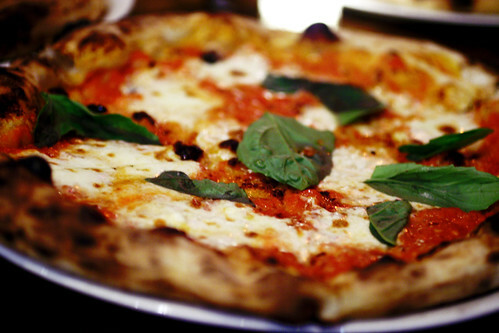 I kind of can't stand the thought of waiting another second to eat their world-famous pizza… heck, if I can't go to Naples for my pizza like Julia Roberts did, this is no doubt a close second! The hubby called and texted during the movie wondering where I was and I got back to him after the movie got out. He was in a tremendously good mood, considering the fact that I had been out having fun doing things like shopping and watching movies all day long while he was at work slaving away. Then I caught on that perhaps HE was enjoying his solo time too. And he was. So I took my time getting home so he could savor it while he could. Needless to say, as much as I enjoyed my day, I couldn't wait to get back to this face and get home to her daddy. Simple living: What would you keep? Of course it got me thinking. We live in such a materialistic society… would we really be happier with less? 1. My iMac. I make my living by this thing- not to mention it houses all of our music and photographs! 4. My Amma's china set. She bought it one piece at a time while she was working hard and living in Iceland. Priceless! 5. These two Bibles (yes, I'm cheating): the first I carried down the aisle on our wedding day. The second belonged to Mum Mum. 6. The artwork that our friend Trish painted that was displayed at our wedding. 7. My Hummell music box… it's beaten up and cracked and worth nothing to anyone but me, but I used to fall asleep to its music every night when I was a kid. It's now in LJ's room. 8. This photo of Mum Mum and me. I'll tell you what, this exercise sure does make you realize how much crap is sitting around in your house that is completely ignored and also makes you realize that perhaps you don't need all this stuff after all. But then again, even though we could get rid of so many things and never miss them, it's hard to imagine a virtually empty house… my head might explode. Is that wrong? Maybe we need a smaller house so it will feel more full with only the things we need… hmmm… I don't know. Either way, I prefer to live in a home that has character because of its decor. Do I need the decor? Nope. But because it's something I personally love- to be surrounded by beauty- it's meaningful enough to me to warrant staying in my home. Cody and I also love entertaining- so that requires a fair amount of kitchen ware and enough place settings for everyone. It's all a matter of what your priorities are- and that's different for everyone. It's the things sitting in my closet that I haven't seen in ages that I question. And lots of other things. Stuff isn't what makes me happy ultimately… it isn't what makes anyone happy. My family and friends and the experiences we share together are what bring me joy, and I'm sure you would say the same of your own. I think it's about time to start cleaning out our closets, organizing, and passing along the things we don't really need to others who would appreciate and have a need for them. So what are your thoughts on this? What are some of the things you would never give up? p.s. I think I would die without a car in Portland. Have you BEEN there? SO MUCH TO DO AND EXPLORE.